Speed - Maximum Lift 18 sec. Speed - Maximum Lower 16 sec. Speed - Maximum Telescope In 17 sec. Speed - Maximum Telescope Out 19 sec. 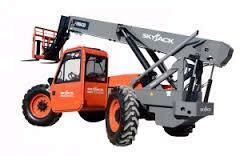 * Please call us for any questions on our forklift reach 42 foot 8k rentals in Tualatin and Eugene, serving the Portland Metro area, Eugene/Springfield Metro area, Oregon, and SW Washington.